Another central theme of the USAID Farmer-to-Farmer Program is citizen diplomacy. The Center for Citizen Diplomacy states that “citizen diplomacy is the concept that every global citizen has the right, even the responsibility, to engage across cultures and create shared understanding through meaningful person-to-person interactions.” Time and time again, Farmer-to-Farmer makes this happen. One of our favorite examples of citizen diplomacy, and a true model of compassion and service, is Dr. Kirk Astroth. Kirk trained representatives from 18 youth-serving organizations in Nepal, including the National Youth Federation of Nepal (NYFN), on methods to engage youth and teach leadership, communication, and advocacy skills. A year later, he is still in touch with his trainees. Kirk’s service went above and beyond the timeframe of his two-weeks in country; the assignment was just the first ripple. After Kirk’s assignment, participants were eager to start new youth development activities. Given their keen interest and commitment, he assisted NYFN to obtain three scholarships to participate in The First Global 4H Summit 2014 in South Korea. After attending the summit and returning inspired, NYFN immediately began the process of registering a 4-H club. In January 2015, they received government approval and established 4-H Nepal, the first in the country. During his trip to the US, Lok also had the opportunity to teach about Nepal. In addition to sharing his experiences with 4-H leaders from 35 U.S. states, he gave presentations to faculty from the University of Arizona’s College of Agriculture and at an Arizona high school. It was a unique and fortunate opportunity for Lok as well as for the numerous individuals that he met. Soon after Lok returned to Nepal, the massive earthquake hit the country. Putting what they learned from Kirk into practice, Lok and the members of the newly registered 4-H Nepal club mobilized nearly 600 youth volunteers to help with rebuilding and relief efforts in 12 affected districts. Just as Kirk had modeled for them, these leaders and the youth volunteers are now modeling compassion and service in their home country. Who knew that a ripple could be stronger than an earthquake? From November 16-December 11, F2F program partners are sharing their knowledge and experience providing technical assistance to farmers, farm groups, agribusinesses, service providers, and other agriculture sector institutions in developing and transitional countries. As aligned with Feed the Future, the U.S. Government’s global hunger and food security initiative, F2F works to support inclusive agriculture sector growth, facilitate private sector engagement in the agriculture sector, enhance development of local capacity and promote climate-smart development. Volunteer assignments address host-led priorities to expand economic growth that increases incomes and improves access to nutritious food. This blog series aims to capture and share this program experience. Happy Thanksgiving! This year, like every year, we are thankful for our wonderful volunteers, including our November Volunteer of the Month, Julie Longland. Our F2F staff are impressed with the extra time that Julie dedicated before and during her assignment, the variety of creative teaching methods that she used during her trainings, and her ongoing support for the F2F Program. In partnership with the USAID-funded Knowledge-based Integrated Sustainable Agriculture Nutrient Project, Julie’s F2F assignment focused on providing pesticide management training to pesticide entrepreneurs (suppliers, retailers, executive members, agrovets, and government officials) in five locations throughout Nepal. As a graduate of Purdue University and North Carolina State University (NSCU) — two land-grant universities with strong extension programs, Julie saw volunteering as a natural expansion of that mission and was always interested in giving back, specifically in agricultural development. Julie first learned of the Farmer-to-Farmer (F2F) Program through one of her professors at NCSU and was immediately interested in volunteering when the opportunity arose. Julie put a lot of effort into preparing for the trainings, incorporating group discussions, answer and question sessions, quizzes, games, and audio/visual materials. In addition to her full training program in the five locations, she also worked overtime to tailor the trainings to each group and prepared additional sessions on special topics for each group based on needs they identified during the first day of the training. Julie’s work in preparing these dynamic sessions will enhance the capacity of agrovets to deliver appropriate guidance on pesticide selection and safe use practices to farmers, and will strengthen their knowledge on best practices to minimize the risk of exposure when selling or handling pesticides. Professionally, Julie enjoys volunteering because it challenges her as a technical expert to explain scientific concepts and processes to diverse groups of individuals with varying education levels in an easily digestible manner. Julie values what she learns on each assignment and is committed to sharing her experience as an F2F volunteer. “It is interesting to see parallels between the U.S. and developing country practices, especially the technologies and polices that we take for granted,” she explains. Since returning to the US, Julie has shared stories and lessons from her assignment with faculty and students at NCSU and staff from the National Science Foundation Center for Integrated Pest Management. 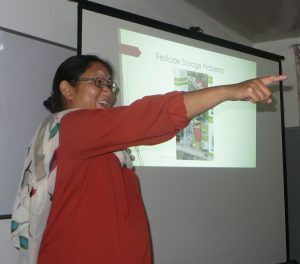 She also shared her training documents to help another individual prepare for his upcoming USAID-funded trip to develop a pesticide manual in Nepal. Thank you, Julie, for all your hard work in helping to improve pesticide safety in Nepal! Since 2013, the USAID Farmer-to-Farmer (F2F) program and associated USAID/Guinea Agriculture Education and Market Improvement Program (AEMIP) have supported L’Institut Superieur Agronomique et Vétérinaire de Faranah (ISAV/F) – Guinea’s only agricultural university — as a provider of research and education to help solve the country’s food security, ag-development, and climate change challenges. As a key step in this process, AEMIP conducted a baseline study for a Global Climate Change Integration Pilot in 2014. During the study, nationwide data was collected to assess the context in Guinea for building the capacity of ISAV/F and other agriculture education and training (AET) institutions to implement climate change adaptation programs and initiatives. AEMIP and F2F are now addressing the recommendations provided in the baseline study to support ISAV/F and AET staff to develop and disseminate climate smart agricultural (CSA) techniques to increase farming revenue and food security in Guinea. AEMIP and F2F have also created a network of Guinean AET institutions to open a forum for discussion and development of CSA techniques and strategies. F2F and AEMIP volunteers have supported the efforts by conducting assessments and providing technical training to ISAV/F staff and organizational development capacity building support to the broader AET network. 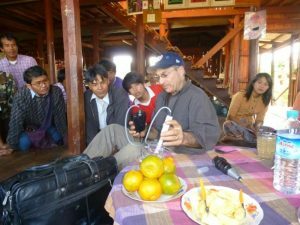 AEMIP supports research teams comprised of ISAV/F faculty and students who engage local authorities, community members, and ag-extension agencies to conduct research on important topics related to climate change resilience and impacts of climate change on potato, rice, and honey production. The program also increases understanding about the causes of climate change and necessary remedies through climate change awareness grants to Guinean NGOs and by showcasing films at ISAV/F on climate change, global warming, climate change policy, and climate adaptation techniques appropriate for Guinea. Farmer-to-Farmer volunteers build the capacity of all types of agriculture sector hosts — including farmers associations, agribusinesses, agriculture education and training providers, government agencies, and NGOs. Volunteer experts have helped host organizations develop governance structures and strategic plans; improve operations and increase efficiencies; diversify and improve services and products… and so much more. As these examples (and many others!) show, capacity building is at the core of the F2F Program. What is technology transfer? How has F2F supported successful technology transfer? What are some of the associated impacts? 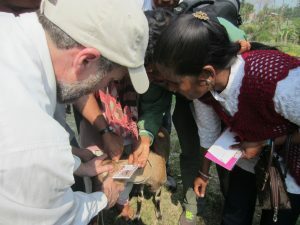 In Nepal, F2F volunteers introduced the FAMACHA card, a simple tool that enables rapid detection of parasites on sheep and goats. Dr. Nelson Escobar trained more than 200 individuals on the use of the tool. After the training, the Ministry of Agriculture and Cooperatives instructed government staff to employ the FAMACHA card in projects nationwide. 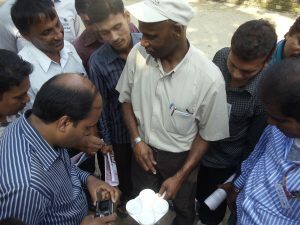 Volunteer Daniel Flaherty likewise conducted training of trainers for extension workers from the Government of Nepal’s Agriculture Food Security Project (AFSP); subsequently, the project purchased 600 FAMACHA cards and trained 250 local service providers to effectively use the tool and offer expanded services to more than 20,000 goat and sheep farmers. There are many other examples of successful technology transfer volunteer assignments and resulting impacts, worldwide. Winrock has implemented F2F since 1991; this is one of the common threads.